The Washington Nationals visit U.S. Cellular Field on Thursday to play the Chicago White Sox. The probable starters are Gio Gonzalez for the Nationals and Miguel Gonzalez for the White Sox. The opening line for this matchup has Washington at -135 and Chicago at +125. The over/under was set at 9. The Nationals have a 27-25-6 over/under record and a 29-29-0 run line mark, meaning they cover 50% of the time. The White Sox are 26-32-0 against the run line and have a 26-29-3 over/under record. They cover the spread 45% of the time. The Nationals head into this matchup with a 35-23 record, including 20-12 on the road. Starting pitcher Gio Gonzalez has a 3-4 record with an earned run average of 3.94 and a WHIP of 1.28. He has 61 strikeouts over his 64 innings pitched and he has given up 65 hits so far this season. He has allowed 9.1 hits per 9 innings and he has a FIP of 3.73. The bullpen this year has an earned run average of 2.88 and they have given up 126 base hits on the year. Teams are hitting .213 against the bullpen while being struck out 170 times and walking 53 times this season. As a team, Washington has allowed 7.51 hits per nine innings while striking out 9.4 batters per nine. They are 3rd in the league in team earned run average at 3.21. The Nationals pitchers have collectively given up 438 base hits and 187 earned runs. They have allowed 57 home runs this season and they allow 1.1 homers per nine innings as a staff. Washington as a pitching staff has walked 165 batters and struck out 548. They walk 2.8 men per 9 innings while striking out 9.4 per 9. They have a team WHIP of 1.15 and their FIP as a unit is 3.48. As a team, Washington is batting .245, good for 17th in the league while putting together a .248 average away from home. The Nationals hold a .419 team slugging percentage and an on-base percentage of .320 which is good for 16th in baseball. They rank 18th in baseball with 8.26 hits per game. Bryce Harper comes into this game hitting .249 and his on-base percentage is at .409. He has 43 hits this season along with 34 runs scored and 37 runs batted in. He's struck out 41 times and has walked 49 times. Daniel Murphy is hitting .379 and he has an on-base percentage of .416. He has totaled 81 hits so far while scoring 35 runs and he's driven in 37. He has walked 11 times and has struck out 25 times. The Nationals have 479 hits, including 90 doubles and 77 home runs. They've stolen 29 bases while they've been thrown out stealing 16 times. Washington has walked 204 times this season and they've struck out 449 times as a unit. They've left 390 men on base and have a team OPS of .739. They score 4.45 runs per contest and have scored a total of 258 runs so far this year. Chicago comes into this matchup with a 13-13 home record and a 29-29 overall mark. With an earned run average of 3.93, Miguel Gonzalez has a 0-1 record and a 1.52 WHIP. He has 29 strikeouts over the 34.1 innings he's pitched during which he has given up 37 hits. He has allowed 9.7 hits per nine innings and his FIP stands at 4.43. So far this season the bullpen has an earned run average of 3.43 and they have given up 145 base hits on the year. Teams are hitting .232 against the White Sox bullpen while being struck out 145 times and walking 73 times this season. As a team, Chicago has allowed 8.48 hits per nine innings while striking out 7.65 batters per nine. They are 6th in the league in team earned run average at 3.67. The White Sox pitchers as a team have surrendered 488 base knocks and 211 earned runs so far this season. They have given up 52 home runs this year and they give up 0.9 home runs per nine innings as a staff. Chicago as a staff has walked 189 hitters and struck out 440. They give up a walk 3.3 times per 9 innings while they strike out 7.6 per 9. Their team WHIP is 1.31 while their FIP as a staff is 3.91. As a team, they are batting .243, good for 19th in the league while putting together a .233 average at home. The White Sox hold a .380 team slugging percentage and an on-base percentage of .314 which is good for 20th in baseball. They rank 19th in baseball with 8.22 hits per contest. Adam Eaton comes into this matchup batting .268 and he has an OBP of .358. He has 60 hits this year along with 24 runs scored and 18 RBI. He's struck out 33 times and has walked on 25 occasions. 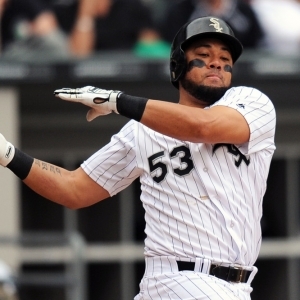 Melky Cabrera is hitting .278 and he has an OBP of .341. He has collected 58 hits so far while he's scored 25 runs and drove in 24. He has earned a walk 20 times and has punched out 22 times. The White Sox as a unit have 477 base hits, including 88 doubles and 52 homers. They have 25 stolen bases while they've been thrown out 13 times. Chicago as a team has walked 189 times this year and they have struck out 460 times. They've had 410 men left on base and have an OPS of .694. They score 4.03 runs per game and have totaled 234 runs so far this season.